A new Fox News poll underscores the hammerlock the mainstream media has on the minds of so many people. After constant anti-Kavanaugh segments on TV news and online/print newspapers such as the Washington Post and New York Times, a record number of voters now oppose President Trump's Supreme Court nomination of judge Brett Kavanaugh. Currently, only 40% would vote to confirm Kavanaugh, down from 45% in August. 50% would not confirm the judge. More voters believe Christine Ford, even though every person she mentioned as at the party where Kavanaugh allegedly abused her have said they don't remember the party and can't corroborate her story. No one backs up her account. 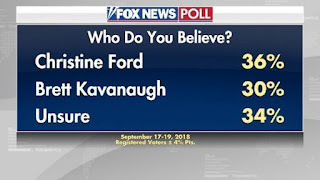 36% believe Ford. 30% believe Kavanaugh. Why does the public believe her more than him when? That these numbers in favor of Kavanaugh are so low at all is directly attributable to negative coverage in the mainstream media. Broadcast journalists were most likely to describe the President as angry, often using highly-charged words to paint him as unhinged or out-of-control. Viewers heard Trump variously described as “furious” (17 times), “fuming” (14), “outraged” (8), “venting” (5), “infuriated” (5), “livid” (3), “enraged” (3), “seething” (2), or just plain-old “angry” (23). When Trump communicated, he was said to be “lashing out” (53), on a “tirade” (8), “blasting” (5), or “erupting” (3). The President was also “on the warpath,” “volcanic,” “unglued,” “spoiling for a fight” and even “went ballistic,” according to reporters at various times this year. The media has trained viewers to see Trump as a volcanic, unstable hothead since before his election. The result? Viewers see Trump as the TV newscasters and print journalists want him to be seen--unstable and unfit for the White House. It's a fantasy designed to persuade voters to elect Democrats and throw Trump out of office in 2020. A review of Google News reveals that substituting "Obama" for "Trump" produces far fewer results along these lines. Rarely is Obama described as "furious," "Outraged," or "fuming." The difference between the coverage of Obama and Trump is striking and betrays the narrative the mainstream media is selling. And it works. The poll numbers prove it works.